His Holiness Dr Vasanth Vijajji Maharaj from Krishnagiri, India is known as an ambassador of peace and a preacher of love, unity and universal brotherhood. His vision and philosophy seek to provide practical solutions to burning issues around the world. He has been instrumental in inspiring millions of lives towards peaceful living, not only at regional and national levels, but also internationally. His journey for a non-violent society began in 1990 as a young adult, and he has been working towards this goal with selfless dedication. He actively organizes events in the form of peace promotions, inter-faith meetings, training workshops, marches, brotherhood camps, children’s competitions, street theatre, musical events, peace festivals, summits, exhibits, cultural programs, feeding the poor and needy, educating them on their rights and working for to improve their conditions, conflict resolution, medical camps, eco-friendly programs, promotion of non-violence through the practice of vegetarianism and creating public awareness of healthy food habits for developing a peaceful mind. The response he has received is always enthusiastic participation from the community; from the general public to renowned scholars, business people, politicians and celebrities. Some of his most noteworthy contributions include organizing the Historic Peace March in India in 2005 bringing ‘all religions on one platform for peace’, and the organization of Vasanth Vizag, a massive peace program in South India in 2009; a gathering of more than 20,000 school children, and launching a campaign against terrorism with the participation of more than 750,000 people. His Holiness also organized the Millennium Development Goal of United Nations & the World Peace Festival in Leicester, UK in September 2008. This 10-day long festival from September 30 – October 8, 2008 was the first of its kind in the world, with the simultaneous lighting of 66,840 candles signifying the world population, together with the additional lighting of 195 different colored candles to represent all countries around the globe. This candle-lighting ceremony, which took place at the Leicester Tiger Grounds in UK on October 5, 2008, was recognized by Guinness as a world record. The public participation was huge, with a diversity of representation from many countries. Notable among the many events organized for schoolchildren by His Holiness was the World Peace Festival in Mumbai, India. The aim of this festival was to awaken the seeds of peace, love and happiness. The purpose of this gathering of both influential people and the common public was to make them understand that they are the torchbearers of peace and they have the responsibility to restore peace in their locality and form peace groups that stand up against any form of violence. This event was a huge success and led to the formation of several peace groups in different locations all over the world standing together for unity, peace and universal brotherhood. Children from various schools in and around South India participated in this event. The theme was universal peace. The enthusiasm and joy with which the children participated made this peace program a huge success. One of the highlights of the event included peaceful carvings and making of sand sculptures at Marina Beach, the second largest beach in the world. Over 750,000 visitors participated in and supported this event. His Holiness’ vision is to “make peace education an international phenomenon” by introducing peace education as a new subject in school curriculum. His mission is to impart universal knowledge and the importance of peace by explaining the role of different sections of society – the role policy makers, principals, teachers, parents and finally the role of children. 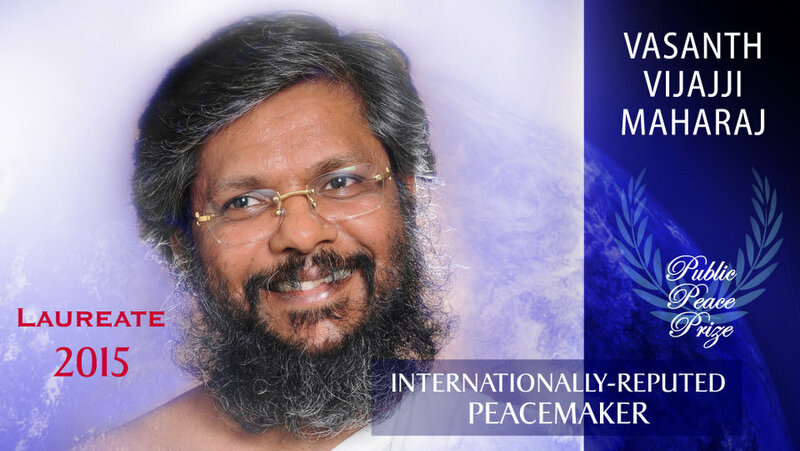 Dr Vasanth Vijajji Maharaj was nominated for the Nobel Peace Prize in 2011; having received more than 5700 supportive nomination letters for his contributions to peace building. He was appointed as Diplomatic Counsellor of India by the International Parliament for Safety and Peace in September 2009 and issued a diplomatic passport. He was also appointed as Deputy Member of the National Assembly of the International Parliament for Safety and honored with the title of Ambassador of Peace for his Commendable Contributions by the Universal Peace Federation in 2009. He is the first Indian Saint to be invited to British Parliament and is the third scholar in the world to be honored with Ayurveda Ratna by Ayurveda council of the UK. The award was presented by the Right Honorable Minister of Justice Simon Hughes at the British Parliament on January 16, 2014. My vote goes to Dr Vasanth Vijaji Maharaj for his noble work. I also vote for his wonderful work towards Peace. I also vote in favor of Him for his work towards peace. My vote to Dr vasanth maharaja……. My vote to Dr. vasanth Vijayji Gurudev. We have questionned many times the spelling of Dr. Vasanth’s name, if you look on the Internet you will see that Vijajji, Vijayji, Vijaji is spelled many different ways, even on his own website it appears under different spellings. We do not wish to be disrespectful in any way. Since the many people who requested that he be nominated at the beginning of the process spelled his name Vijajji, we chose to use that spelling, and it would take alot of time to change the spelling all over our graphics and on our website. So, with all due respect, we will leave the spelling as Vijajji. Heartily congratulations to our Gurudev. This is wonderful news. I share this feeling of triumph for”GURUDEV”.. The entire nation is proud of his momentous achievement.Jai Jai Gurudev. Feel proud to have a great Gurudev who topped the world peace award and made the nation proud.